Fine. I'll admit it. I'm a picky eater. A foodie. A gourmande. Whatever the label, I like to eat good food!! The more I know about food and the more exquisite food I have the occasion to dine on (thank you to the ever expanding Des Moines restaurant landscape! ) the harder it is on the discerning palate.... when the kind of food I like; fresh, creative, seasonal, vegetable filled and flavorful is not readily available. I'm talking about traveling. Yes, traveling can be one of the best ways to experience food, depending on where you're headed. Through, traveling often traveling by car, through rural areas, finding good food can be particularly difficult. I've been burned by looking for those hidden gems along the roadside, led astray by out dated Internet directions... it seems that many of those mythical home-made roadside places seem to have vanished (unless you're Jane and Michael Stern, which, of course I'm not). However, I'm here to tell you that you don't have to settle for bad food or fast food when you leave your comfort zone. Here are some guidelines that started to present themselves on a Summer road trip I took through Northeastern Iowa and Southwestern Wisconsin. 1. Pack some snacks, sandwiches, and water. Bringing along some comforting things like the snacks you might keep around your house (granola bars, cheddar bunnies, pita chips, etc.,) will tide you over if you aren’t willing to settle just yet. Plus, you can make a picnic at a rest-stop, town square or park. 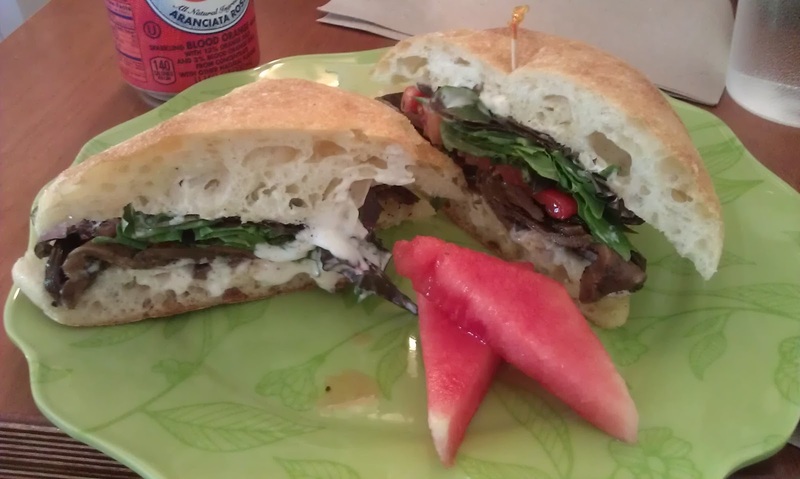 Just because a cute little town doesn't meet your needs for food, doesn't mean that you can't always enjoy the scenery while eating your delicious sandwich from home. 2. Be Flexible: You may have food rules, like not eating at chains. You might be a committed vegetarian. You might want only to eat organic or local. These are good ideas and commendable principles to live by but on a road trip, you are not always going to find it. You just aren't. It is relatively easy to find guilty pleasure food i.e. fried tenderloins or fried cheese balls on the road. This is what I mean by be flexible. Sometimes, this is the good food for the moment. Sometimes you just have to get over yourself and settle. Especially when you’re starving, grumpy and driving through rural areas. So go ahead and pull over at the local A&W. 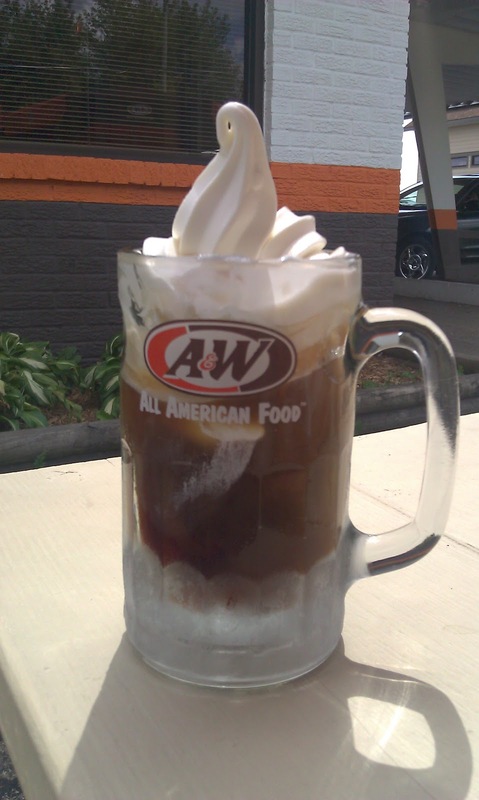 Have a root beer float and enjoy it. After all, it is a cultural experience... just not the one you may have had your heart set on. 3. Keep your eyes peeled for organic markets, coops, and establishments that advertise things like “farm-fresh, organic, local, fresh” rather than “home-made” which can be a gamble. We found some nice markets and coops that had delis. These are the places that are going to have conscientious food and real coffee… and often times this food is much tastier and much healthier than your local dive or pub and grill. 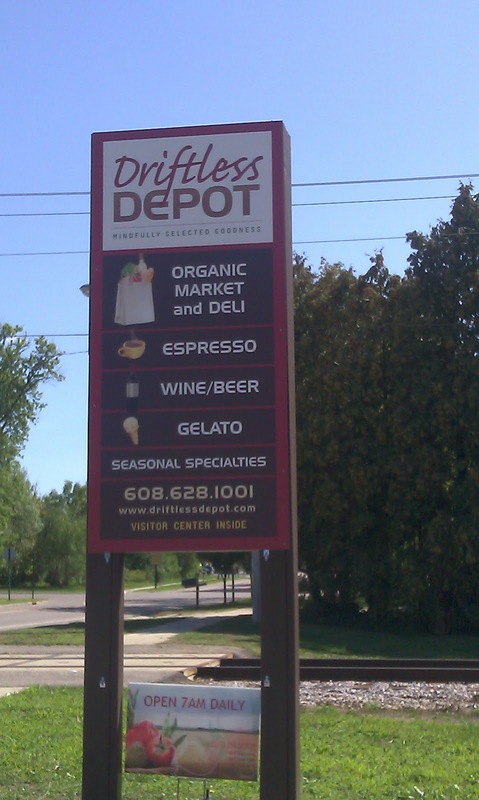 We found this little market The Driftless Depot near the House on the Rock in Wisconsin. They were well stocked! A kind lady at the Driftless Depot was kind enough to make me this amazing marinated eggplant sandwich, even though they had technically stopped serving lunch. Lucky for me, she hadn't put away all the fixin's yet. 4. Bring a cooler. We are now the owners of a mini-cooler that lives in the trunk of our car. You might just find some delicious local delicacies you’ll want to bring home. 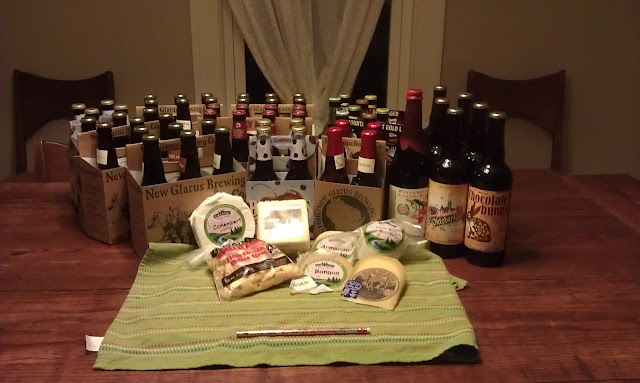 our beer and cheese haul from Wisconsin! 5. Investigate. Don’t be afraid to walk in to an establishment, take a peek and turn right around. If you go in and and realize that it’s not for you, don’t be shy about turning around and walking out. It’s your vacation, you want to enjoy it . You’ll probably never see them again, so who cares what they think! 6. The Internet can be misleading. You can trust reviews online, such as Yelp, to a certain extent. But ssometimes it’s just better to go and see for yourself. What may have had a bad review might just please your taste buds. Names can be misleading, and so can addresses, and even hours of operation. Check it out in person, and you might find what you're looking for... and if not, then see # 5 again. If you're doing any traveling this holiday season, or any time at all, have fun be safe and remember #2: be flexible! !